On Friday, 27th May, SIH will invite the most active participants of the project in Lithuania to take an unforgettable one day tour to Anykščiai with poetry readings. Anykščiai is a tiny bit of land surrounded by crystal-clear lakes, proud of its high mounds, rich cultural heritage and a lovely countryside. During the tour, such famous places in Anykščiai, as a birthplace of many prominent Lithuanian writers, will be visited: A. Baranauskas and A. Žukauskas-Vienuolis museum, as well as Anykščiai Regional Park (Monument of J. Biliūnas „The Light of Happiness“, the Treetop Walking Path, Puntukas Boulder). The tour will culminate at Burbiškio Manor with a reading of “Anykščių šilelis” – the poem of A. Baranauskas, the most prominent work of Lithuanian poetry in the first half of 19th century. The second week of May, prior an international poetry festival and the most outstanding yearly literature event POETRY SPRING is being held all over Lithuania, SIH organised poetry readings with our teachers and students. SIH students in different languages read poetry of Lithuanian and foreign authors, organized poetry discussions, and create their own poems using the Poetry Writing Game created by the project. Teen groups wrote a poem in the style of the known rapper Benjamin Zephaniah, based on the words of his song “Confession of a runner”. 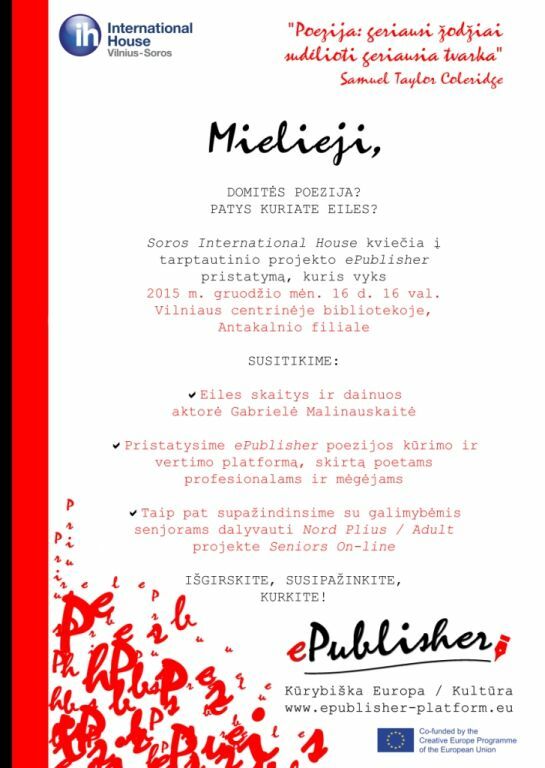 On Saturday, 23rd April 2016, Multikultura will organise a Public Reading of poems published on ePublisher platform by Polish poets. The event and discussion will take place at the Literary Salon of Polish Writers Association, 7 Kanonicza Street, Krakow. The last weekend of April Multikultura is organizing a tour for Polish poets, who are registered on ePublisher platform. All ePublisher poets from all over Poland are invited to come to Krakow to visit some poetry places and together with the project team from Multikultura take part in the events “The Book and Rose”. This week SIH is holding a poetry reading event at Medardas Čobotas Third Age University (MCTAU). During the event the ePublisher project and the poetry platform will be presented to the participants and a lecture on the poetry of Vytautas Mačernis, a great Lithuanian poet, will be delivered by prof. Virginija Šlekienė. The event will culminate in the poetry readings, performed by an actress Gabrielė Malinauskaitė and the participants of the event – MCTAU Literature Faculty and Book Lovers’ Club members. The event will take place on Friday, 8th April 2016, from 14:00 at LEU Philology Faculty, Ševčenkos 31 – 305. We invite all readers and poetry lovers to join us at such a nice event! ePublisher project partners started implementation of public poetry reading events in all partner countries. Until this autumn a number of variuos poetic events will be organised in Lithuania, Poland, Portugal and Finland, such as poetry readings, excursions to the local poetry places, meetings with local literary communities. Stay tuned to our events calendar to keep updated on the pulse of ePublisher! In March 2016 the project partners met in Krakow to review the progress of the project and to discuss the development of the on-line tools as well as the upcoming poetry promotion events. SIH invites everybody to join us at the live webinar "Virtual learning communities: opportunities for self-expression and professional development". In this webinar, you will learn more about ePublisher project and the poetry platform, as well as LeaCoMM platform for teachers and teacher educators working in multilingual and multicultural environment. The live-streamed webinar will be held in Lithuanian on Tuesday 8 March at 14:00. The webinar is open, click to join. This webinar will be held in the framework of National Open Education week organized by Lithuanian Distance and eLearning (LieDM) Association in collaboration with EDEN – European Distance and eLearning Network. SIH invites all readers and lovers of poetry to join us for a lovely morning to learn out about ePublisher project, to enjoy poetry and the upcoming Holidays! The meeting will take place on Friday, 29 January 2016, from 10:00 at Martynas Mazvydas National Library of Lithuania, Gedimino 51. SIH invites all readers and lovers of poetry to join us for a lovely afternoon to learn out about ePublisher project, to enjoy poetry and the upcoming Holidays! The meeting will take place on Wednesday, 16 December 2015, from 16:00 at Vilnius Antakalnis Library, Antakalnio 49.